Analyzing Chart Patterns: Why Charts? The head and shoulders (HS) is a reversal pattern signaling the prior trend is reversing, or has already reversed. The HS top alerts traders that an uptrend is over and the price could head lower, while the HS bottom notifies traders that the downtrend could be over the and the price will head higher. A HS top is formed when the price makes a high, pulls back, makes a higher high, pulls back, and then makes a lower swing high. This creates three peaks, with the one in the middle being the highest. The topping pattern is typically only relevant if seen after a substantial advance. Connect the two lows within the pattern with a trendline. This is the "neckline." If the neckline is angled up, traders will often enter short positions, or sell long positions, when the price falls below the trendline after the third peak. If the neckline is flat or angled down, traders will enter short positions, or sell long positions, when the price falls below the latest pullback low. When the price falls below the neckline, or latest pullback low, it is called a breakout. The breakout indicates the pattern has completed and the price will likely proceed lower. If entering a short trade at the breakout level, a stop loss is placed above the high of the right shoulder. Once a pattern completes the price will frequently, but not always, move back to, or above, the breakout point. This occurs in the chart above, where the price drops below the neckline but then rallies back above it a few later before continuing its downward course. It's for this reason a stop loss is placed above the right shoulder on short positions, as this helps reduce the possibility of being stopped by these small price moves against the trade direction. The estimated downside move after the pattern completes is the height of the pattern subtracted from the breakout price. For example, if the breakout price is $20, and the high during the pattern was $25, the height of the pattern is $5. This indicates a drop to $15. In the first chart example the height of the pattern subtracted from the breakout would result in a negative price. That can't happen, so in such cases another estimation method is required. Percentages can work well. Assume the top of a pattern is $60 and breakout point is $30. We don't want to assume a stock will go to zero using the conventional approach, so percentages provide a much better estimate. The decline from $60 to $30 is 50%. Therefore, take 50% of $30 to get a target of $15. This is more realistic than $0. The rationale for the topping pattern is that uptrends make higher swing highs and higher swing lows. Once the pattern completes the price has already made a lower swing high (right shoulder) and potentially a lower swing low at the breakout point. Therefore, the uptrend is seriously drawn into question, and signs of a downtrend have already emerged. The head and shoulders (HS) bottom, or inverse head and shoulders, occurs after a downtrend, and signals an uptrend may be starting or underway. The pattern is created by a swing low, followed by a rally, a lower swing low, a rally, and then a higher low. 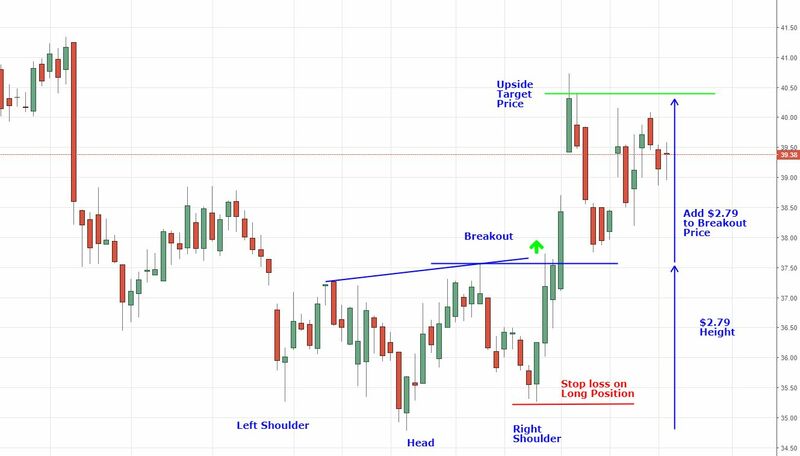 If the neckline is flat or angled down, long positions are often taken when the price moves above the neckline. This is the breakout point and signals the pattern is complete. If the neckline is angled up, enter long when the price moves above the latest rally high (the most recent of the two) within the pattern. Place a stop loss below the low of the right shoulder. Once the price breaks out it may not always proceed immediately in the expected direction, and having a stop loss below the right shoulders helps reduce the chance of being stopped out as the price oscillates around. The projected upside price move once the pattern completes is based on the height of the pattern. Add the height of the pattern to the breakout price. For example, if the low of the pattern was $50, and the breakout point is $60, the height is $10 and the upside target is $70. The rationale for the pattern is that the once the pattern completes there is already evidence that the downtrend is over. Downtrends make lower lows and lower highs, and the higher right shoulder means that is no longer occurring. Also, at the breakout point the price is typically making a higher high, which is a trait of uptrends, not downtrends. The target estimate for the pattern is only that: an estimate. The price may not reach the target, or it may move well past it. If there was a large uptrend, followed by a small head and shoulders, if the price does turn lower the decline could well exceed the estimate based on the small head and shoulders pattern. While the targets are a good guide, the size of other price moves surrounding the pattern can also be taken into consideration. The drawback of HS patterns is that the reward-to-risk is often not that attractive. Depending on the size of the right shoulder, the stop loss amount on the trade is often only slightly less than the potential profit which is based on the full height of the pattern. If risking $100 a trader may extract $120 to $200, equivalent to a 1.2:1 to 2:1 reward-to-risk. Favor patterns where the expected pay off is at least twice the risk. Since the stop loss, entry point, and target are known before a trade is even taken, traders can asses which trades are worth taking and which are not. While not all HS patterns are worth trading, when the pattern completes it still provides analytical insight as to whether the price is likely to head lower or higher over the next while. This aids in confirming trades which may result from other strategies. Watch for higher prices if these stocks complete inverse head and shoulders patterns (a bottoming pattern). Some of these stocks are exhibiting big chart patterns, so a breakout is likely to be significant. These three stocks are near major breakout points, which will affect the short-term, and potentially the long-term direction of the stocks. Dow component United Technologies could break 2015 resistance in coming weeks and head toward $160. A number of technical signs point to a rise in shares of TJX, parent company of T.J. Maxx. Even Elon Musk has hinted that Tesla stock might be a bit pricey.